The ISEE is the ACT of private school admissions. Just as colleges use the SAT and ACT to determine applicant preparedness, many independent schools across the US achieve the same effect with the ISEE. The ISEE is a nationally standardized test, meaning that it tests concepts which a national panel of educators have agreed upon. These standards are from the National Council of Teachers and Mathematics (NCTM), the International Reading Association (IRA), and the National Council of Teachers of English (NCTE). There are four levels of the ISEE depending on the grade level a student is applying to. Students applying to grades 9 – 12 take the Upper Level. Students applying to grades 7 and 8 take the Middle Level. Students applying to grades 5 and 6 take the Lower Level. Students applying to grades 2 through 4 take the Primary levels 2, 3, and 4 respectively. 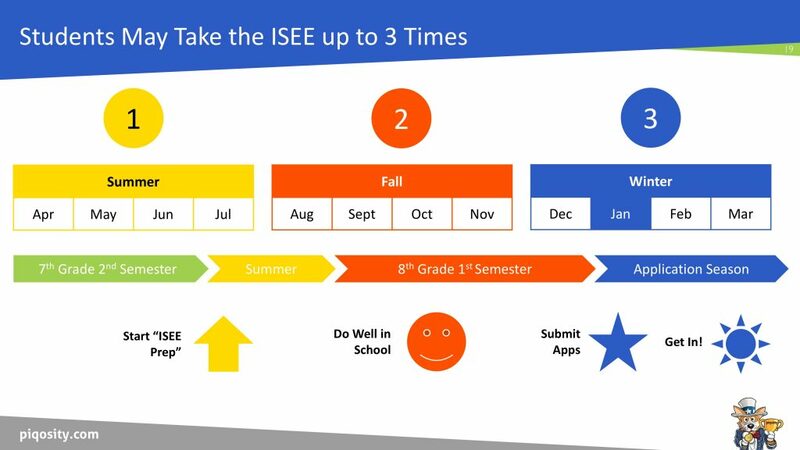 Since Fall of 2016, students may now take the ISEE up to three times a year or once each during three 4-month periods generally corresponding to summer, fall, and winter. These 4-month periods are set by ERB; a student could not, for example, take the ISEE in both December AND January because of the limitation of taking the test only once during each prescribed period. Let’s now assume that you are a current 4th grader looking to apply to 5th grade, which is generally the “prime entry year” for a private elementary school. The first opportunity to take the ISEE would be in the spring and summer during and after your 3rd grade year, April through July. The second opportunity would be during the fall of your 4th grade year between August and November. The third and last opportunity would be during the winter of your 4th grade year between December and March. We recommend that you start thinking about the admissions process by the summer after 3rd grade. You should evaluate what schools you want to attend and what your application needs to like to maximize your chances of admission. Depending on what schools you want to apply to, fall of 4th grade is serious work. You need to do well in school but also ensure that your tests and applications are in order. Come winter, it will be time for you to submit your applications, and you’ll have one last chance to take the ISEE if your scores are still not where they need to be. We recommend that students plan to take the ISEE the maximum number of times allowed with the understanding that more opportunities provide more chances for their desired score. Parents must register their students to take the ISEE on the ERB’s website where they will select a date and location. Typically, the testing location will be at a private school or at ERB’s contract testing partner, Prometric. The registration fee is usually between $100 and $150 but varies according to testing site, accommodations, and time of registration. When taken at a school, the ISEE is generally offered as a paper and pencil test. At Prometric, the test is only offered on the computer. Parents may want to consider whether their child would do better on a computer or on paper. Parents have three options by which to receive their child’s scores. They can receive the scores online at ERB’s website 7-days after the test is scored for no additional charge. An expedited service costs extra, which usually results in scores being available online within a few business days of the student’s test date. 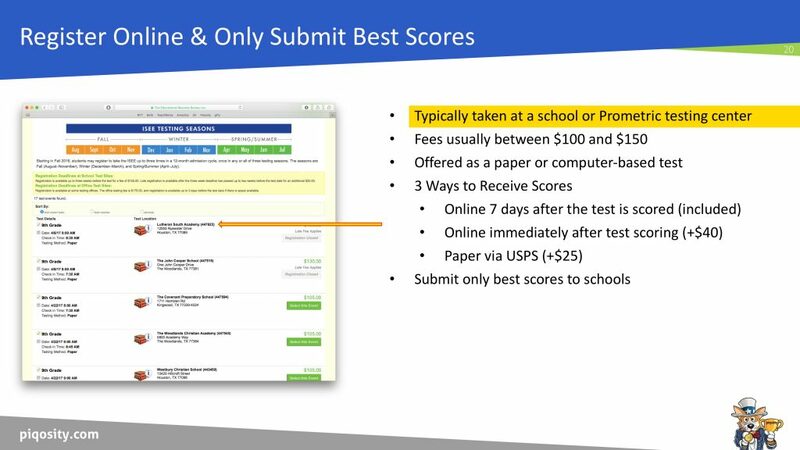 Additionally, parents can pay an additional fee to receive the scores via US mail. Parents should review their child’s scores before submitting them to schools via the ERB’s website. Schools will only see the results that parents submit, and schools generally only want applicants to submit one set of scores. The ISEE Lower Level is a 5-part, 2 hour and 20-minute test with two breaks lasting between 5 and 10 minutes each. Students will be tested on their knowledge of vocabulary, reading, writing, and math. High achieving students at competitive schools should have already learned most of the tested concepts by the end of their first semester in 4th grade. However, there will be some questions that ask about concepts that students have not learned as the ISEE Lower Level is the same test taken by students applying to both grades 5 and 6. The ISEE is both an achievement and a reasoning test. Achievement tests strive simply to determine if a student has learned something they were taught. 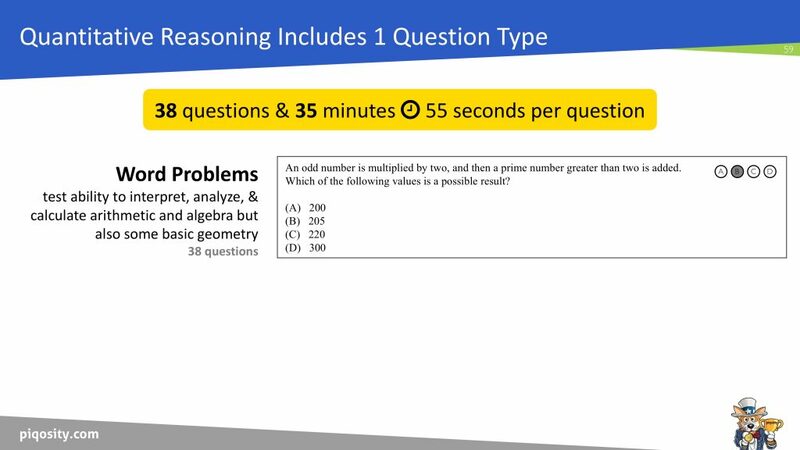 A reasoning test goes a step further to determine if a student can leverage what they were taught to reason their way through related but new and novel concepts. To this extent, there are four, scored sections of the ISEE – two that test reading and vocabulary skills (Verbal Reasoning and Reading Comprehension) and two that test math skills (Quantitative Reasoning and Mathematics Achievement). Our experience over the last 10 years with students in Houston is that the Quantitative Reasoning section tends to give students the most trouble because of the high level of abstract reasoning required by many of the questions. 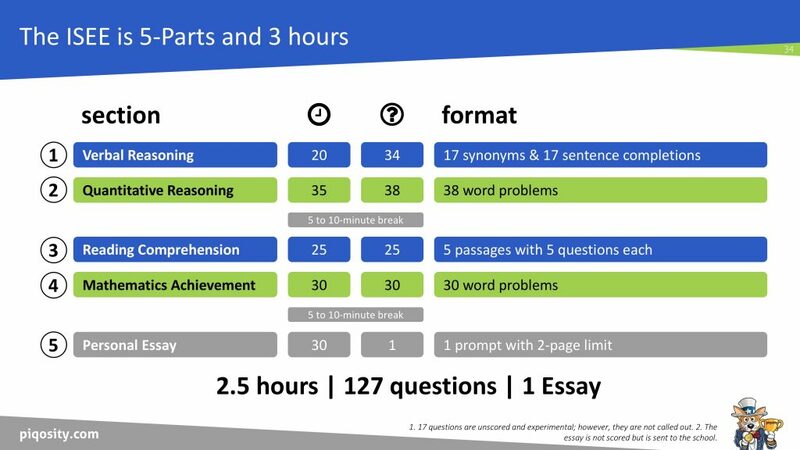 Conversely, the most competitive section is Reading Comprehension, meaning that many students tend to do well on this section such that even missing just a couple of questions results in a lower score. Why do other students affect your child’s score? It’s because the ISEE is a peer-normed test. The ISEE is scored along a normal curve, also called a bell curve, in which students are given a score relative to their peers – the norm group. For the ISEE, the norm group is students applying to the same grade from the three years prior to your student’s year. Scores from the current year are not part of the norm group; therefore your student is not competing against their friends. Additionally, your student’s norm group is comprised only of students applying to the same grade. For example, a 4th grader will not be compared against an 5th grader. These scores are then arranged in order and divided into nine, standardized groups, or sta-nines, ranging from 1 (lowest) to 9 (highest). Scores of 4, 5, and 6 are statistically average, while scores of 7, 8, and 9 are above average. The stanine is what you will hear parents and schools talk about. 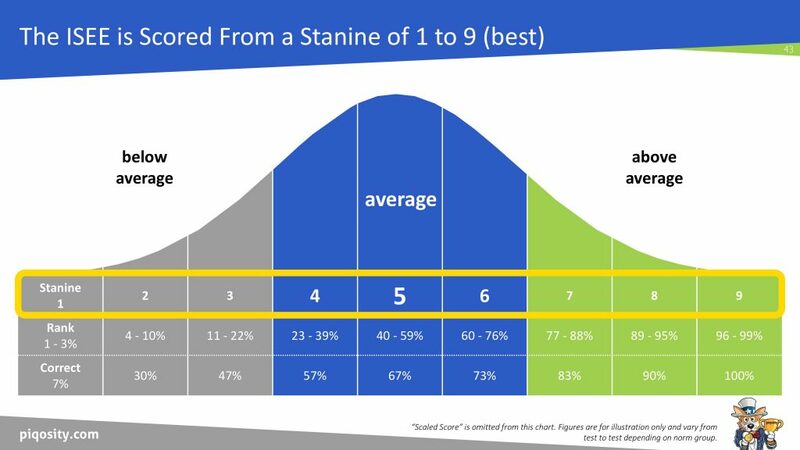 The percentile rank says the same thing as the stanine but is more specific on where the student falls within the stanine. The scaled score is more of an ERB internal measure by which to ensure that each iteration of the ISEE is of comparable difficulty. Note that in this normal curve graphic, the percentage of questions correct is a “best guess” based off our experience with working with students over the last 10 years and will vary from section to section. For example, students must get more questions correct in Reading Comprehension to score highly versus Quantitative Reasoning. Additionally, this number will change from year to year depending on the norm group. What constitutes a “good score” is dependent on the schools to which your student is applying. For example, for an academically rigorous school, students should aim to score a 7, 8, or 9 in order to be competitive. Conversely, for a school that prides itself on accepting a wide academic range of students, average scores of 4, 5, and 6 are certainly acceptable. Depending on the student’s holistic application, even below average scores of 1, 2, and 3 can still be considered for admission. The first section of the ISEE is Verbal Reasoning, which presents 34 questions to be answered in 20 minutes. 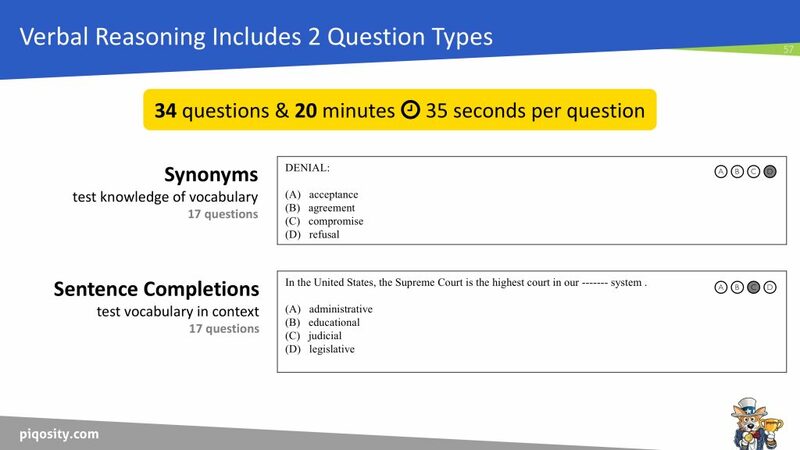 At 35 seconds per question, it is fast-paced, and it is all about the strength of a student’s vocabulary and their ability to apply it. Students will encounter two types of questions – synonyms and fill-in-the-blank sentence completions. For the synonym questions, students will be presented with a single word in all caps followed by four additional words. They must choose the word that is most similar in meaning. The difficulty of this section comes from having to know all the various definitions of a word without context, including some very difficult ones that many adults don’t even know. The second set of questions are sentence completions where students are presented with a sentence that has a single missing word or phrase. Relative to synonyms, the context clues given by the sentences tend to make these questions a little bit more manageable for students. Quantitative Reasoning is the second section of the ISEE and is generally considered the most difficult. 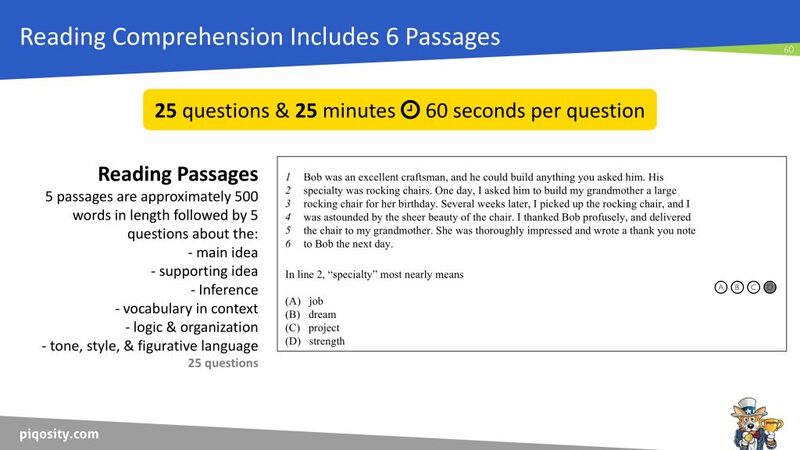 In this section, students have 35 minutes to complete 38 questions or just over 55 seconds per question. Calculators and scratch paper are not allowed on the ISEE. Calculators are strictly prohibited, and the only scratch area provided is the test booklet itself. Word problems present math questions in paragraph format where students must correctly translate words into mathematical functions. The tested material comes from basic number operations, algebra, and higher level math concepts such as geometry and data analysis. Our experience is that most 4th graders should have seen most of the tested concepts by the end of December of their 4th grade year. After a 5 to 10-minute break, the third section of the ISEE is Reading Comprehension. In this section, students are presented with five passages followed by five questions each in which they have 25 minutes to complete. Assuming that students spend half of their time reading and half of their time answering, that’s about 2.5 minutes per passage and half a minute per subsequent question. Each passage is roughly 400 to 500 words or about the length of your average online blog post or daily newspaper article. Passages come from both fiction and non-fiction works but excludes poetry. Lines are numbered but key words are neither bolded nor underlined or otherwise called out for students in any way. Therefore, “active reading,” the process by which students are underlining and circling, may be very helpful here. There are five types of questions asked: main idea, supporting idea, vocabulary-in-context, tone, style, and figurative language, and everybody’s favorite “inference,” in which students must determine what the author might say or believe based off what the student read. The Reading Comprehension section is where most independent school students tend to do the best or feel like they did the best. However, given how highly so many students score on this section, and that the ISEE is graded on a normal curve, the Reading Comprehension section also leaves the least room for mistakes. The Mathematics Achievement section is the fourth and final scored portion of the ISEE Lower Level. Students are presented with 30 questions and given 30 minutes to complete them or about exactly 1 minute per question. 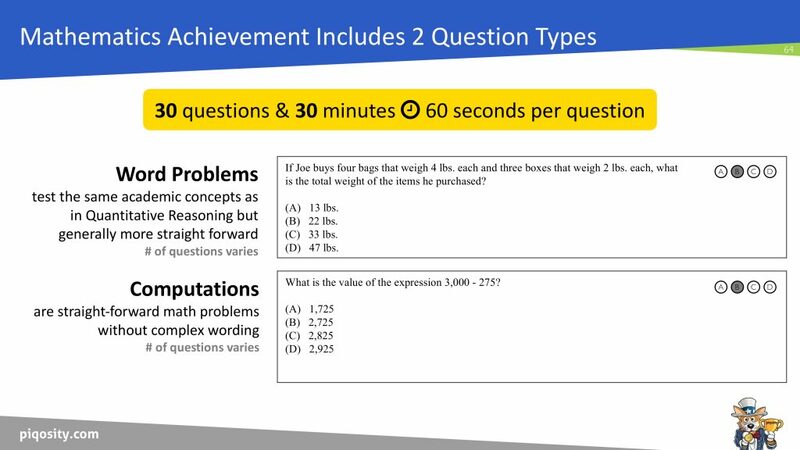 Much of this section is composed of word problems similar to the Quantitative Reasoning Test. However, these word problems tend to be a little more straight forward. But in exchange for their simpler presentation, they may require students to do time-consuming mathematical computations. Additionally, a handful of questions will be simple computations in which questions are presented with standard math notation accompanied by little to no wording. Like the quantitative reasoning section, tested math concepts include basic number operations, algebra, and introductory geometry, which most 4th graders should have seen by the end of their first semester. After a second 5 to 10-minute break, the last section of the ISEE is the personal Essay. Students are presented with 1 prompt and are given 30 minutes to organize their thoughts and write them out. The essay is not scored by the ERB. Instead, schools receive a copy of the student’s maximum 2-page essay and are allowed to draw their own conclusions. The prompt is usually personal in nature meaning that students will not be required, for example, to have outside knowledge of current events or facts and figures. 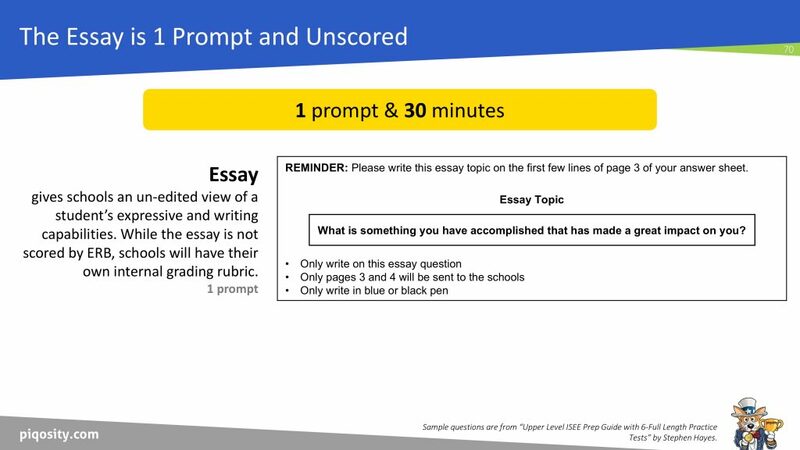 Students should strive to logically and concisely address the given prompt. Schools will primarily want to see how students express their ideas in writing under pressure and without the benefit of third party editing. Since it’s a personal essay, the schools also want to see if the student can understand how topics relate to them and how they’ve learned from their experiences. This translates well to how they’ll perform in Humanities courses and on Science papers. 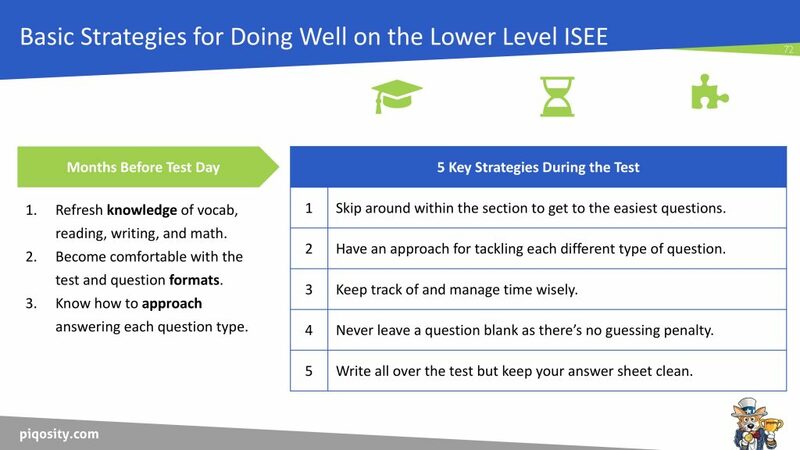 Like any other academic test, the ISEE Lower Level is very much an exam that students can and should prepare for. To this extent, almost every test maker including the ACT, SAT, and ISEE provides some sort of free or paid for preparation materials. And while there’s no published research specifically on the ISEE, given that it’s a relatively niche test, the voluminous research on SAT and ACT testing is clear. Preparing for and taking those similarly designed tests reliably results in higher scores. When and how much a student should prepare depends on the academic competitiveness of the schools to which the student is applying and how well the student is already doing in school. We recommend that students take either a real or practice ISEE by the summer before they plan to apply to a new school. The results of that “diagnostic test” will then guide them and their educators on how much preparation they will need in order to perform well on the ISEE. Core academic competency is king. No amount of strategies, tips, and tricks will enable students to ace the ISEE if they do not have a firm grasp of the tested academic material in math, English, reading, and writing. Easily 85% of a student’s preparation time for the ISEE will be spent ensuring that they are comfortable with basic academic content. After this arduous task, students need to ensure that they’re comfortable with the test format, directions, and question types – this is to save time and reduce anxiety. Skip around within the section to get to the easiest questions. Have an approach for tackling each different type of question. Keep track of and manage time wisely. Never leave a question blank as there is no penalty for guessing. Write all over the test but keep the answer sheet clean to ensure accurate scoring.